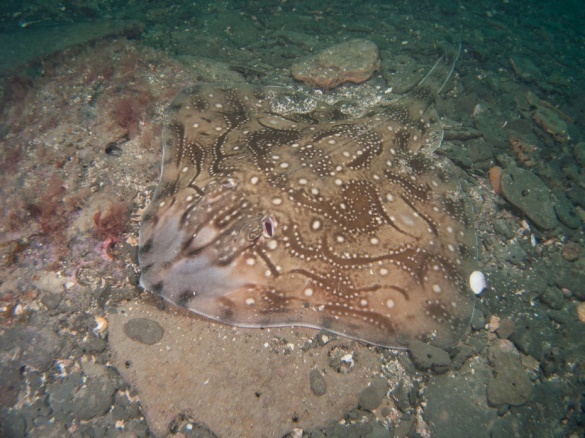 Although undulate rays (Raja undulata) are on the IUCN Red List of Threatened Species, they are known to be patchily distributed in the English Channel with sites of local abundance. The identification of one particular site in Dorset where Raja undulata are commonly seen provides an opportunity to repeatedly observe them in their natural habitat. Photographic techniques have been used to record the pattern on the upper surface of numerous fish. These patterns are unique to individual fish and not 100% symmetrical between left and right dorsal surfaces. Using image recognition software and comparing pattern features individual rays can be identified with confidence. The frequency of repeat sightings of approximately 1 in 5 suggests the population visiting the site is not huge. Repeated sightings of the same individual are often months or years apart perhaps suggesting that the rays are periodically visiting the site but do not remain there permanently. 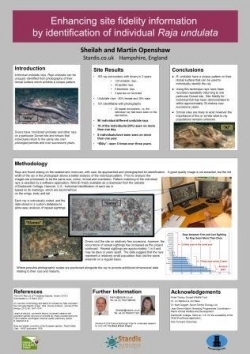 Numerous dives over a three year period on a particular Dorset site has provided an opportunity to observe undulate rays in their natural environment. The site is less than the size of 2 football fields and the rays have been seen in the summer periods from 2012 to 2015. One hundred and sixty three encounters have been recorded, the majority of these (135) being with undulate rays (Raja undulata). 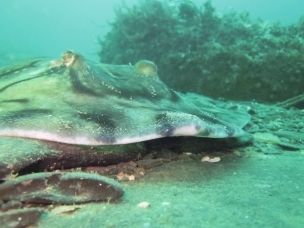 Undulate rays are a threatened species, being considered rare although they are reported as abundant in patchily distributed areas along the English Channel including Sussex, Poole, around the Isle of Wight, Lyme Bay and the Channel Islands. 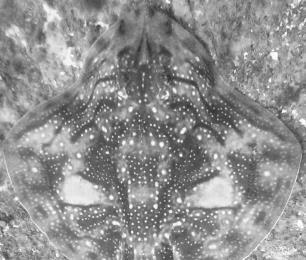 Divers occasionally report seeing undulate rays and other species along the Dorset coastline however we are not aware of records existing of congregations of rays in any particular place. 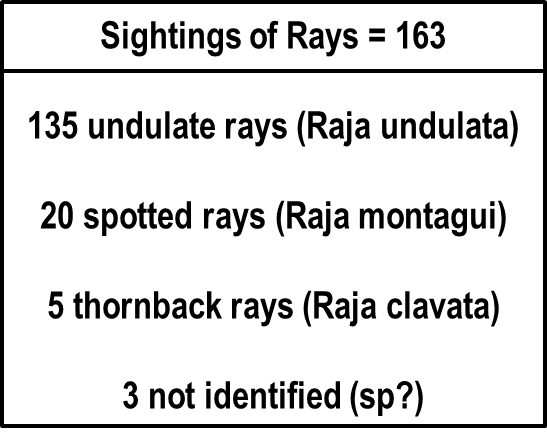 Given that Raja undulata is considered a relatively rare UK ray species, the large percentage of undulate sightings (over 80%) is of particular note. The rays are found resting on the seabed and although some can be quite skittish and will dart or, more likely, gracefully swim away as a diver approaches, others are comparatively placid and can be approached with care. 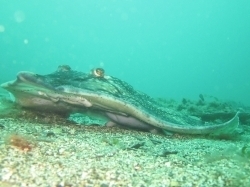 In most cases where an undulate ray is seen, it is possible to approach closely, photograph the fish and in many cases, place a photographic scale close by to give an indication of size. The undulate rays vary in colour from predominantly brown through greyish-brown to predominantly grey. They are patterned with wavy, undulating dark bands and varying amounts and sizes of white spots. In 1926, Robert Selby Clark reported that “In the examination of thousands of Rays, I have never met with examples which have been perfectly symmetrical.” This comment was relating to the size and shape of undulate rays however the pattern of bands and spots is also asymmetrical and seen to be unique to the individual fish. 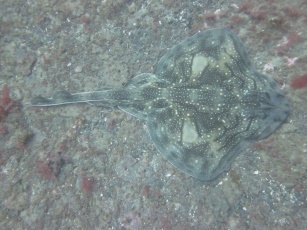 By comparison of photographs showing the pattern and marking, single individual fish can be identified with confidence and matched to previous sightings of the same ray. 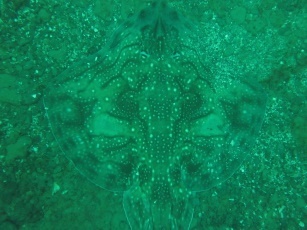 Obtaining a good quality image of a ray underwater in UK conditions is however not necessarily easy. Visibility can vary dramatically from 15+ metres (easy) to 2 or less metres (not easy). The diver needs to be mid water, 1 or 2 metres above the fish and there will generally be some tide movement pushing the diver along; attempts to stay stable in one position are likely to disturb the ray causing it to swim away, along with any chance of obtaining a photograph. Trying to overcome this with more elaborate equipment means that more care must be taken not to disturb the fish. To get the full width of the ray in the frame of the photograph requires the camera to be some distance above the fish. At this distance in UK waters, there is inevitably a considerable amount of material in suspension between the camera and the fish, any use of the built in flash therefore causes a large amount of backscatter, obscuring the subject of the photograph. Under these conditions, we have had most success getting overall images of the fish by using a small, relatively low-cost compact camera, with natural light. As seen above left, this often produces dark, greenish images of little photographic merit but these photographs can easily be processed by readily available software to highlight the pattern and marking. By detailed comparison of the pattern with particular attention to the asymmetry of individual markings on the fish it is possible to identify individual undulate rays with confidence. Ninety six individual undulate rays have been recorded and photographed on this site between 2012 and 2015. Of these ninety six fish, nineteen individuals have been seen subsequently, several days or weeks later. Eight of the nineteen individuals have been seen on separate years. One individual, named “Billy” has been recorded on at least one occasion each year during the three year period up to 2014, including 3 times in 2013. We know the rays are not always there but we have no knowledge of where they go, how frequently they may visit the site, how far they may travel, whether they remain close by between sightings or whether they visit on occasional days as part of much wider travelling pattern. Hopefully more information gathered from this site, the possible identification of similar sites will compliment other research studies and provide answers to some of these unknowns. Although the data remains insufficient to draw firm conclusions, the following observations would appear relevant. Given the few occasions that divers visit the site over the three year period, the occurrence of repeat sightings at approximately 1 in 5 suggests the rays represent a relatively small population that visit the same area/site on a regular basis. They appear to be resting during the day, often remaining in the same position for several hours but why they are in the area remains unknown. The scarcity of single individuals being seen many times suggests the rays may visit the area on a periodic basis. The IUCN Red List of Threatened Species. Version 2014.3. <http://www.iucnredlist.org>. Downloaded on 15 March 2015. 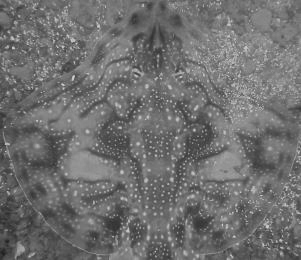 An overview of the biology and status of undulate ray Raja undulata in the north-east Atlantic Ocean. Ellis, McCully & Brown, Journal of Fish Biology (2012) 80, 1057–1074. Rays and skates: a revision of the European species. Robert Selby Clark. HMSO publication 1926.